Orange trees grow almost like weeds here in the Algarve, except when I try to grow one of course! However, driving through the Algarve countryside it grieves me to see the amount of oranges that are just left to rot on the trees or on ground where they fall – what a waste! Still, hopefully by Christmas I may have a few home-grown oranges of my own which will certainly not be left to rot. Always on the look out for unusual recipes I rediscovered this recipe in some old recipe notes I’d made years ago. It’s low-calorie and low-fat, so probably I was on a diet at the time! Adding mint, and a fresh lemon juice and vinegar dressing gives these simple sliced oranges a really unusual twist. Peel oranges and remove pith. Cut oranges across the diameter into thin slices. Place into serving dish in layers sprinkling a little fresh mint on each layer. Mix lemon juice and wine vinegar. Add salt, pepper and sugar to personal taste. 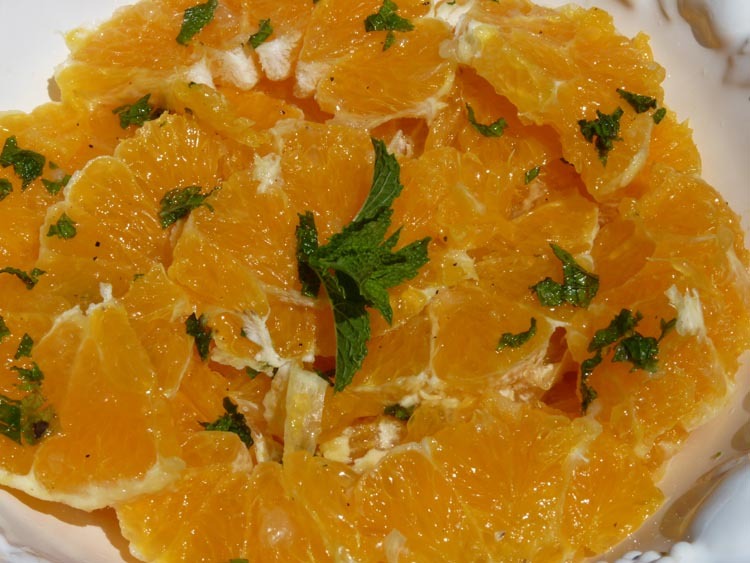 Pour dressing over oranges and garnish with sprigs of mint. Mint and orange go surprisingly well together, but it is the dressing that gives this salad a real “zing”. Mr. Piglet was not to sure as I served it for his dessert. Perhaps I should serve as a starter? or please share your favourite recipes which use fresh oranges! I searched for orange cake recipes for you, but haven’t tried them out myself. Good luck! Hi Marion, thanks I will check them out! We love this salad and make it a lot. And sometimes as dessert we serve it with sugar and cinnamon….yummy! Hi Chica, it’s quite quirky not sure if I should serve it as a sort of starter, as part of a salad or as a desert. I made it again recently skipped the vinegar and lemon, and added blueberries. Delicious! Hi Sami, give it a try! Like the look of the recipe will give it a try. Sounds good! Will try it with the vinegar and with the cinnamon and sugar as soon as I can get my hands on fresh oranges. The ones on my tree are still green and small. The cinnamn does sound an interesting combination! Sounds lovely. Thanks for that – will give it a go. This looks so healthy and tasty, PiP, I would never have thought of this combination. One thing I miss about living in Portugal was picking fresh oranges and lemons. Sitting under the shade of a tree having a freshly squeezed lemon over the sardines and a nice juicy orange to finish off lunch, what more could you ask for. I’ve never thought of having mint and orange but it does look tasty – and refreshing.